Extend your The Settlers of CatanÂ® game to include more players and more scenarios. More tiles, more resource cards, more development cards, and components (settlements, villages, roads) for two additional players. 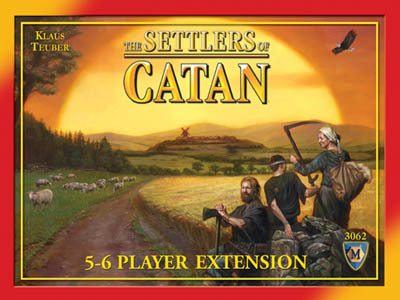 Allows for two additional players to be added to The Settlers of CatanÂ®. This is a great way to get more people involved, or have more room to play and expand with a 4 player game. Very helpful to have this extension so more people can play! Game takes longer with the addition of two more players but you can always bend the rules to where you take all resources of where you place your first two settlements. I adore this game! The ability to play with more players while playing catan is amazing, it also adds in speed building which is an interesting rule where you can build at an time used to speed the game up. If you have more then 4 friends pick this one up. Being able to add up to 6 players is a big deal for us making this a "must have" item! I love the bigger island. I confess that we always set up with the larger island now even with 4 players. We got used to the extra space and some of the people I play with aren't very confrontational so it works out. The game scales up nicely to 5 or 6 players and with the ability to build after each person's turn, the game still moves along at a good pace. The extension really makes the game more fun. It gives you the pieces to make a bigger board and two new colors. The thing I like most about playing with 5 or 6 players is the fact that you can spend resources in between everyone's turn, not just your own. I would recommend this to everyone who already has Settlers. Obviously, if you want more people to play at the same time you will need this expansion. It even throws in a new rule with the added players and makes a bigger Catan for you and your friends to settle! I always like the possibility of including a 5th player in our games, since we often have exactly that number of people playing. For Settlers, this has been achieved very elegantly and with very few changes to the rules. The only major change is the introduction of a "everyone can build" phase, which is actually a great addition that enables you to get rid of cards more easily if you have passed the hand limit.